At 21, I was pre-diabetic, depressed, always exhausted, had horrible menstrual cycles and suffered from unmanageable back pain. I thought maybe it was the stress of college that ailed me, but found when I returned home that I fared no better. I still napped every day, only to wake up more exhausted. Sitting or standing for long periods of time proved painful. Concentrating on tasks took all my strength. It was then at 22, that I decided this was no way to live – how did other women my age have so much energy? I knew I needed to do something to improve my quality of life. After much research, I challenged myself to try a whole-foods, plant-based lifestyle for one month. This meant I ate only unprocessed food: fruits, vegetables, grains, nuts, seeds, and legumes, and absolutely no animal by-products. If it came in a box and contained more than five ingredients – any of which I couldn’t pronounce – I didn’t eat it. I did not eat any meat, poultry, seafood, dairy or eggs. How did I do it? I cooked – a lot. Everything from overnight oats in a jar, to big pots of vegetable chili, to my own salad dressings and ice cream made from just bananas. In 30 days, I felt like an entirely new person. I dropped weight and became leaner. I had so much energy, I didn’t know what to do with it! I felt wide awake for most of the day, even at 8pm – no naps, no espressos, no energy drinks – just pure focused energy. I slept like a baby and felt rested when I awoke. My blood sugar levels regulated. My acne disappeared. My back and menstrual pain reduced significantly, and occurred less frequently. Everything I ate before was brown or white. Whole grain cereal and skim milk? Brown and white. Whole wheat, low sodium turkey sandwich? Brown and white. Low-oil chicken saag and roti? Brown and white. Biryani? Brown and white. Hamburger and french fries? Brown and white. My favorite dessert was a fudge sundae. Do you want to guess what colours that is? I have a pineapple mango spinach smoothie with oats for breakfast: yellow, orange, green. Lunch is bean salad with mixed peppers, arugula (rocket), and purple cabbage: yellow, orange, red, green, and purple. Snacks are a bowl of berries: red and blue. My secret to great health is to "Eat the Rainbow"! The idea seems laughable, but there’s science to back it up. Recent research has linked a “healthy” dietary pattern to a lower risk of depression, anxiety, and bipolar disorder in adults. Micronutrients – or as they're better known, vitamins and minerals – are the building blocks of our bodies and allow balanced chemical reactions to occur more effectively throughout our body. For example, Vitamin B6 and B12 deficiencies have been linked to depression (2). Correcting these deficiencies suggests decreased depressive symptoms (2) The growing body of evidence linking diet and mental health is certainly promising. However, rigorous scientific trials are needed to determine causality. 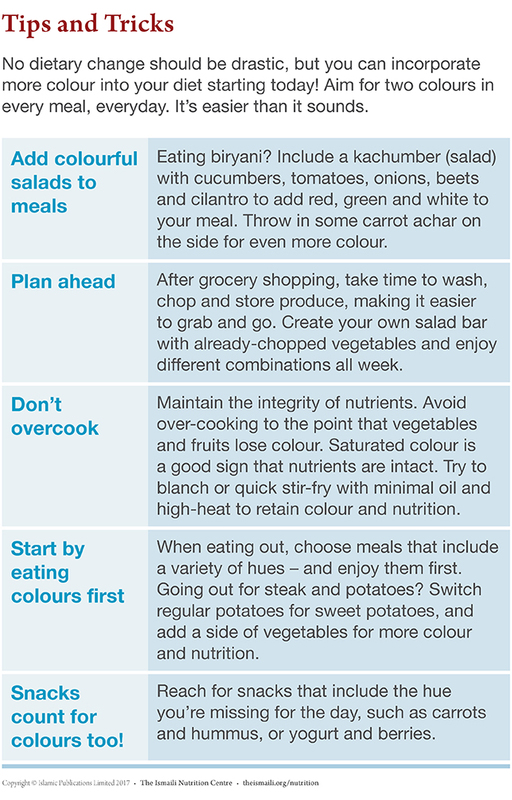 The best way to ensure you are getting the entire host of nutrients your body needs is to Eat the Rainbow, because every colour of the rainbow is connected to a different nutrient composition. For example, green foods are rich in chlorophyll, while purple/blue foods are rich in anthocyanins, and one does not occur in the other. This means that a purple cabbage and a green cabbage have entirely different nutritional make ups! 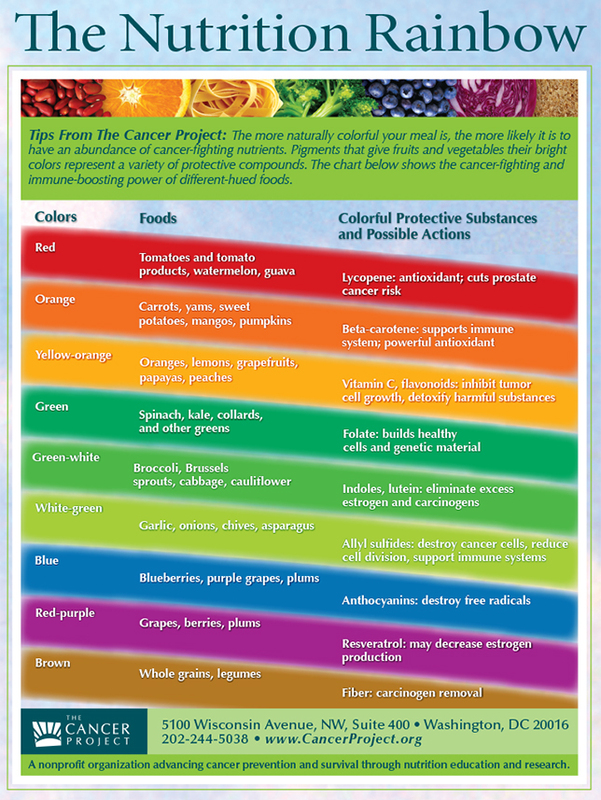 Check out The Nutrition Rainbow, from The Cancer Project, to learn what colours are associated with which nutrient. The problem with what I was eating before was that (with the exception of the brown and white fruits and vegetables) generally, brown and white foods tend to come from animals and/or processed carbohydrates – both sources that typically contain high amounts of salt, fat, cholesterol, and sugar. By eating a colourful diet, I was healing nutrient deficiencies** in my body, and ensuring I was consuming anti-oxidant-rich foods that were low in fat, salt and artificial sugars. This is called high nutrient-density. Remember, if you plan to follow a plant-based diet and exclude animal products, then you will need a reliable source of vitamin B12; an essential vitamin, not found in plants. Nabila Juma is a graduate of the Maryland Institute College of Art and The T. Colin Campbell Centre for Nutrition Studies, and is a certified Plant-Based Chef. As Head Designer at Petit Vour, she is committed to sharing the benefits of vibrant plant-based living, and of practicing spirituality through creativity.